One of the frequently asked question in many forums is “I am an admin on the machine (Windows Vista or Windows 7 or Windows 2k8) where SSRS is installed but I am not able to access the reports”. Recently I faced a similar issue. I am an admin on the machine which has Windows 2008 R2 installed. On top of it, I installed SSRS 2008 R2 and then configured the RS with proper values. I once again checked my configuration but everything looked fine. Since the error message gave some hint on UAC, I ran the browser as admin and navigated to the report manager. Now it did not throw any error message. I was able to see the home page and all other menu including the Site Settings. Closed the browser and opened it again in normal mode. Still it was throwing same error. Opened the browser again in Admin mode. Navigated to the home folder and added myself and assigned to all the roles. After this when I ran the browser in normal mode, I was able to access all report manager and all the folders. 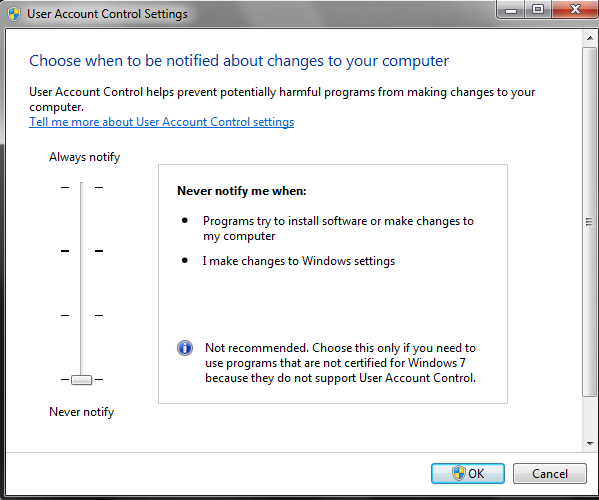 The issue is that by default UAC allows the users (even the administrators) to do the tasks with the privilege of normal user, i.e, say when you open the browser or an application, it is opened with the normal user’s privilege and not that of administrator’s privilege. What I understood is that when I opened the browser in normal mode, UAC passed standard user’s privilege to SSRS and hence SSRS was not able to identify that I am an admin. To get the admin access either I have to run the browser in admin mode or add myself explicitly to SSRS System Admin roles. 2) Manage your UAC appropriately. In our previous articles, we have seen how to install SQL Server Reporting Services and to create a new report using the Report Wizardand Report Designer Window. Now, in this article we are going to see how to configure SQL Server Reporting Services in Windows Server 2008 environment. To deploy the report on a server and to use it across the environment we need to have the Report Server up and running. To do so we need to do some configuration for the report server. It will be covered in this article. Let us see the step-by-step process on the configuration of the SQL Server Reporting Services. Considering that SQL Server Reporting Services (Denali or 2008 R2) is installed, we will step forward to do the configuration. Go to All Programs>> Microsoft SQL Server 2008 >> Configuration Tools>> Reporting Services Configuration Manager as shown in the screen below. 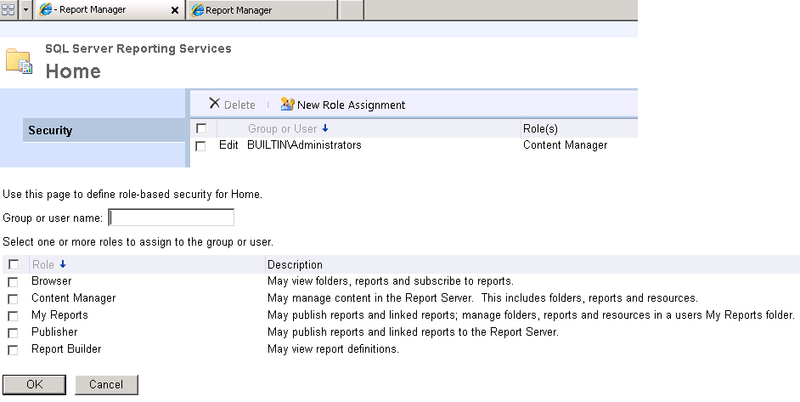 The Reporting Services Configuration Manager will open as shown in the screen below. Now we need to connect to the instance on which we need to configure the SQL Server Reporting Services. A pop-up window will appear prompting to select the Server Name and Instances Name. Select the appropriate Server and Instance Name and click on Connect as shown in the screen below. Once connected successfully, we can see the Reporting Services instance running and option to start and stop the services. In addition, we can also see the details of the server running as shown in the screen below. Now click on the Service Account on the left side menu to configure the account details. Here, we have two options to select the account details. If our server is domain controlled then we will go ahead with selecting the domain user name and password. Else, we can use the built-in account as shown in the screen below. Once we select the account click on Apply button to save the configuration. Now click on the next menu Database to create a new database or use an existing database for the SQL Server Reporting Services for saving all the reporting server data and application data for running the reports. Click on Change Database to select the database as shown in the screen below. Once we click on the Change Database button, a new pop-up window will be displayed to configure the database. Here, we can select to either create a new database or use existing database as shown in the screen below. Follow the basic steps used to create the database. Once the default steps are passed, we can see that the database is created as shown in the screen below. Now click on Finish button. We will see the database selected and the login details on to the main wizard as shown in the screen below. Once the required changes are done for the database, click on Apply to save the database configurations. Now go to the next menu Report Manager URL and select the Virtual Directory. Name it as per the requirement, else by default we can use the one created by the server (Report) as shown in the screen below. Click on Apply once we are done with the configuration. If the configurations are done correctly, we will see the Report Server screen as shown in the screen below. In the above screen, we can see some of the projects deployed to the server, which we will cover in our next article. Therefore, in this article we have seen how to configure the reporting services on to windows server 2008 server. In our next article, we will see how to deploy the Reporting project, which we created in Part 2 of this series. The first step towards our task is to open Business Intelligence Studio. To open it, we would need to navigate through Programs >> Microsoft SQL Server Denali / Microsoft SQL Server 2008 as per the installed version and select Business Intelligence Development Studio as shown in the screen below. This will open Visual Studio. It is the Business Intelligence Development Studio for SQL Server as shown in the screen below. Now select File >> New >> Project to create a new project. We can directly use the shortcut Control + Shift + N to open a new project as shown in the screen below. Once we have selected the New Project, a list of templates will be available as shown in the screen below. Select Report Server Project template from the list of templates available and provide a valid name for the project as shown in the screen below. Clicking on OK will create a project and open the project in the SQL Server Business Intelligence Studio as shown in the screen below. Initially, there are no files created and only two folders are available. The next step is manually adding a report to the project. To add the report, click on the Reports folder in the solution explorer and select ADD >> New Item as shown in the screen below. Selecting Add New Report will go directly to the Report Wizard that we have already covered in the previous article. Now, a window will be displayed with a list of available items that can be added to the project as shown in the screen below. SelectReport from the list, provide a valid name and click on Add button to add a report to the project. This will add the report to the project and open the Report Designer to allow designing the report as per the requirement as shown in the screen below. Next step is to go to the Tool Box. Then drag and drop a table to design the report as shown in the screen below. Now we need to configure the data set first in order to design our report table. To do the configuration we would first need to create a data source. This can be achieved by clicking on the New button. It will open a window where we would need to supply the details of the connection string as shown in the screen below. Configure it based on the database from which the data for the report needs to be collected. Clicking on OK will go back to the old window with the data source available for pulling the data for the report. Now click on the Query Designer button to build the query required to pull the data as shown in the screen below. Clicking on Query Designer will open a new window as shown in screen below. Write the query required to fetch the data. In this example, we are going to use the Authors table from the Pubs database. Once we write our query, click on the Execute button to get the complete details of the data for our reference to finalize the query. We can perform as many executes as required to get a final data as per the business requirement as shown in the screen below. Once we are done, click on OK to close this window and navigate back to the wizard. Clicking on OK button will go back to the previous window and we can see the selected query available in the list as shown in the screen below. Click on the OK button to complete the process. With this, we can see the table created in the designer view as shown in the screen below. We can customize the table as per our requirement. Now we need to customize the report by dragging the outline of the table to the required length and width as shown in the screen below. Select the columns based on the requirement and edit the headers to the required customized format as shown in the screen below. Click on the Preview tab to view the report’s preview as shown in the screen below. Now we can see the report output in the preview mode. We can build and execute the project if we are satisfied with the report output. Else, we can go ahead and change the report design based on the business requirement. Since we have not used any inbuilt wizard, we need to manually do all the customization (Selecting Styles formats etc.). Now we have made some customization as shown in the screen below. Press F5 or hit the Play button from the tool bar to build and execute the project to get the report output. However, we will get an error message that the start-up report project is not specified as shown in the screen below. Go to the properties of the project and select the report as shown in the screen below. Since we have not used any wizard to build the report generation, these steps needs to be performed manually. Once again, press F5 or Play button from the tool bar to build and execute the project. This will present the result as shown in the screen below. Thus, in this article we have seen how to design and generate report from scratch without using the Report Wizard with the help of SQL Server Business Intelligence Studio.